We handle Medicare Supplements, Medicare Advantage Plans, & Medicare Part D. We also handle Life & Health plans. 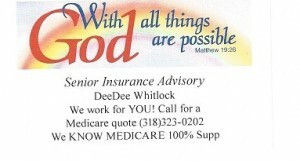 I have been in the Medicare Insurance business since 1985 started telemarketing for Medicare Supplements and decided to get my Insurance License in 1987. My office is open from 8am until 4pm Monday - Thursday and close at 3pm on Friday. We service each policy and handle ANY problems you may have. We handle every company that is available in our area and always keep up to date with all the changes annually. Customer Service is our specialty we go above and beyond to keep you happy!!! We always handle EVERY plan available! We work for YOU!! !